Posted 11:51 pm by Jonny Pigg & filed under Gig. Saltburn’s social justice party starters return to celebrate there 5th anniversary of putting on socially conscious events on Saturday 22nd of September. This special night is also Playing for change day 2012 and also the birthday of founder member of 4 People Not Profit Justin York, and also fellow Saltburner’s Tim Coyte and Rachel Chatto. The event will be in the main lounge of the Marine Saltburn and will run from 7.30pm till late and as ever is completely free. Playing for change are a charity group that raise money to build music schools in deprived parts of the world where there would usually be no access to such facilities. Once a year they organise a Playing for change day where a day of musical events are co-ordinated around the world raising money to support music schools and programmes that are created and operated by local communities in developing countries. 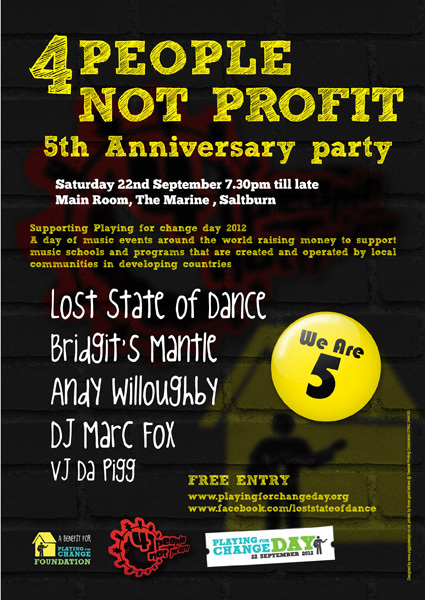 So this year 4 People Not Profit will be part of Playing for change day 2012 on Saturday September the 22nd. With this being such a special 5th anniversary event of 5 years of creative and inspiring 4 people not profit events in Saltburn and Middlesbrough area, we have an equally special line up. Headlining with the superb Lost State of Dance, a prog infused electro pop rave up. As they put it ‘loads of sweeping 80’s analogue keys and techno samples. Muse crossed with Prodigy with a little bit of Ultravox. In support will be Bridget’s Mantle, Irish folk heroes who played at the very first 4 People not Profit event. Also Andy Willoughby Saltburn’s very own renowned performance poet. And of course we will have resident DJ Marc Fox playing his booty shaking funk soul and breaks, and Visual wizardry from VJ artist Da Pigg. So tell all your friends and family and get down and don’t forget to bring your dancing shoes and get ready to boogie at this special 4 People Not profit 5th anniversary event.